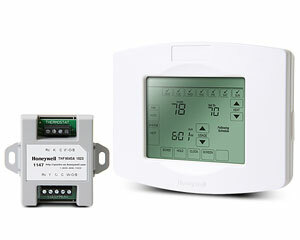 This Honeywell ZWSTAT Zwave Thermostat is a touchscreen thermostat that is programmable and z-wave enabled. It also comes with a little converter that changes 4 wires to five wires. So you can power your thermostat without having to run an additional wire. Most Zwave thermostats do not have this little handy part. 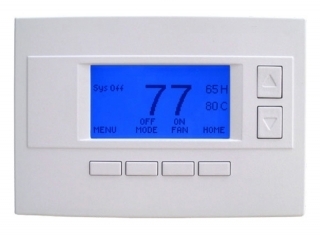 However, other zwave thermostats use battery power to get the extra power needed for a touchscreen and zwave. This one just uses this handy converter. 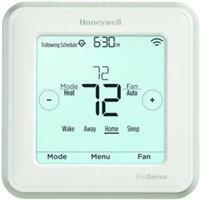 It has been discontinued and replaced with the Honeywell Z-wave Thermostat. 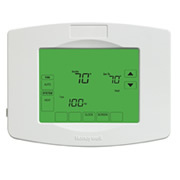 This thermostat works with any Z-Wave platform, but it also works with ADT Pulse and the Tuxedo Touch. 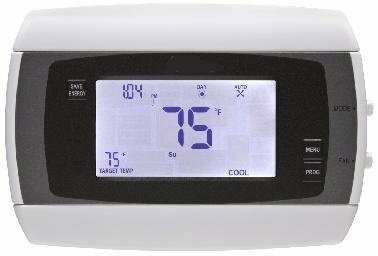 Honeywell, the number one choice of homeowners and the world’s leading brand for temperature control, continues their tradition of excellence and quality with the ZWSTAT Z-Wave® Thermostat. ZWSTAT communicates via z-wave with the ADT Pulse Gateway, ZBRIDGE Z-Wave® Energy Management Module, Tuxedo Keypad, Vista Automation Module, or any other z-wave controller to enable automatic control with Honeywell’s leading security systems, making it an ideal addition to any Z-Wave connected home or building. Additionally, precise temperature control enables ZWSTAT to provide better comfort, fewer temperature swings, and more energy conservation. Users can also create keypad lockouts in homes and businesses. This is an excellent way to save money and energy by curtailing children and unauthorized personnel from adjusting the thermostat. In addition, other notable features include the ability to alternate between heating and cooling based on temperature settings, alerts to change air filters and pads, fan circulation and more. 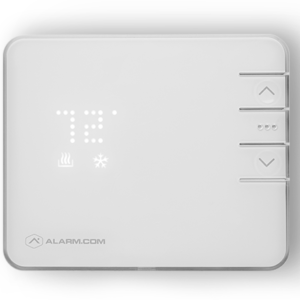 Adaptive Intelligent Recovery: Allows the thermostat to “learn” how long the furnace and air conditioner take to reach programmed settings, so the temperature is reached at the scheduled time. Keypad Lockouts: Optional “range stops” can be created to keep temperature settings limited to a minimum/maximum setting—ideal for retail and residential applications where employees and children may attempt to adjust thermostats. Fan Circulation: The fan circulation feature moves air when heating or cooling is not required—saving energy and helping to eliminate hot and cold spots. *Honeywell programmable thermostats can save homeowners up to 33%, or up to $200 a year, on annual heating and cooling costs. Numbers based on average annual utility costs of $1500 with 50% going to heating and cooling costs and 33% savings if used as directed. Savings may vary depending on geographic region and usage. See www.energystar.gov for more information.